Persistence was the key for Shantal Solomon ’17 (Boston, Mass. ), who will graduate with a double major in biology and psychology and a minor in neuroscience. Solomon grew up in the city’s Mission Hill neighborhood. For high school, she attended Boston Community Leadership Academy, one of the smallest public high schools in Boston. It offered a rigorous college preparatory program with college acceptance as a graduation requirement. Students were nurtured to be future leaders, and their capstone courses required service in the community. Shantal Solomon ’17 wants to attend medical school to become a pediatric psychiatrist. Solomon excelled there, graduating among the top five in her class, and played varsity basketball for Brighton High School and New Mission High School while attending the leadership academy. A guidance counselor recommended that she apply to Providence College. In her extended family, she is only the fourth person to complete a college education, along an uncle and two cousins. Her decision about where to go to school was purely financial. PC offered her a scholarship in biochemistry, her intended major, and she liked the campus when she visited. Her social adjustment wasn’t a problem. Solomon made friends. But the classroom experience was a different story. Solomon thought seriously about dropping out of school or transferring. But instead, she made adjustments. 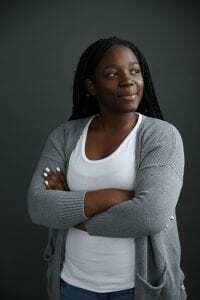 She continued to major in science, but switched from biochemistry to biology, then added a second major in psychology and a minor in neuroscience. She sought tutoring help in the Office of Academic Services and continued it through her senior year. She began to understand that her past academic experience, strong as it was, did not prepare her to compete with peers who attended high schools that offered more science courses, even Advanced Placement courses, which were unavailable to her. “I went to one of the best public schools in Boston, and there were still things we didn’t have access to,” said Solomon. During her first year at PC, Solomon went home to Boston every weekend to work long shifts in the Niketown retail store on Newbury Street. That wasn’t conducive to studying, so in her sophomore year, she took a work-study job on campus, signing students in and out of residence halls. Staying on campus allowed her to join more activities. She played intramural basketball, then joined the women’s basketball club team, which competes around New England. She played as a guard and served as the club’s vice president. She also joined the Board of Multicultural Student Activities and became active on its Diversity Committee, which brings diverse programming, activities, and guest speakers to the campus community. In her sophomore year, Solomon reapplied to be a member of Friars Club, the premier service organization at PC. 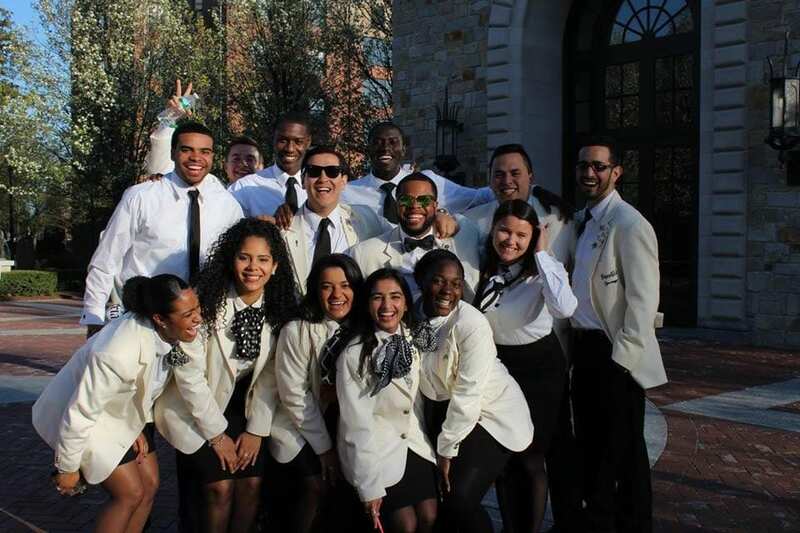 Its 75 members, chosen after interviews, wear distinctive white jackets as they lead campus tours for prospective students and their families, volunteer at events such as commencement and Alumni & Family Weekend, serve as honor guards at funerals, and perform service around Providence. Solomon applied her first year but wasn’t chosen. She was successful in her second attempt, and it opened a new world to her. She mentioned Victoria Timmel ’17 (Smithtown, N.Y.), one of three valedictorians of the Class of 2017, and Charles D’Alessandro ’17 (Franklin Square, N.Y.) as science majors in Friars Club who inspired her. Shantal Solomon ’17, far right in first row, with Friars Club members. Solomon also found a new academic adviser in Dr. Brett J. Pellock, associate professor of biology. She never had him for a class, but she noticed that he had a nice way of interacting with students. She asked if he would be her adviser, and he agreed. He became a sounding board and offered her encouragement. In her first psychology classes, Solomon began to discover her career goal, to become a pediatric psychiatrist. She realized that in the inner-city world in which she was raised, mental illness was a stigma. No one mentioned it — and that needed to change. Solomon isn’t Catholic — she attends a Baptist church — but when she heard about the Campus Ministry immersion trip to Jamaica to work with mentally and physically disabled children and pregnant teens through Mustard Seed Communities, she signed on. Friends in Friars Club then encouraged her to apply for a Father Philip A. Smith, O.P. Fellowship for Study and Service Abroad. The program’s purpose is to introduce PC students to the service work done by Dominican friars and sisters in all corners of the world. After a detailed and selective application process, Solomon was named one of 10 fellows for the summer of 2016. She was accepted to travel to Trinidad and Tobago for seven weeks to work with the Dominican Sisters of St. Catherine of Siena, who operate an orphanage and youth center for mentally and physically abused children in Etrepagny. But just days before Solomon was to depart, her cousin David was shot and killed walking between her grandmother’s house and his own. He was 22. It was the first time that Solomon had traveled alone outside the country. She worked with children in classrooms, observed social workers, and attended lectures about medication and pediatric psychiatry. She will walk across the stage at the Dunkin’ Donuts Center to receive her diploma on May 21, two days after the one-year anniversary of his death. She will cross the stage for both of them, knowing that he died before he had the opportunity to pursue his goal of returning to school. Solomon credits her roommate and friend, Jaida Judge ’17 (Dorchester, MA), an elementary and special education major and Spanish minor, with helping her to stay on track. “Every time I doubted myself and wanted to give up, she picked me up, encouraged me, and told me that quitting wasn’t an option, and that us inner-city kids were destined for greatness,” Solomon said. After graduation, Solomon will work while applying for academic-enhancing master’s degree programs to prepare her for medical school. She attended a session at the Alpert Medical School at Brown University that discussed non-traditional ways to attend medical school, aimed at increasing the number of people of color who become doctors. “It was refreshing to see people of similar backgrounds and how they got to medical school,” Solomon said. On the first day of her neuroscience capstone with Dr. Thomas J. Guilmette ’78, professor of psychology, Solomon looked around the room and realized she was the only student of color there. Her eyes filled with tears of pride. She realized she had accomplished what she set out to do even when others told her she could not.